Once upon a time, there was a wise man who used to go to the ocean to do his writing. He had a habit of walking on the beach before he began his work. One day, as he was walking along the shore, he looked down the beach and saw a human figure moving like a dancer. He smiled to himself at the thought of someone who would dance on the beach in the day and so he walked faster to catch up. As he got closer he realised it was a young man and was not dancing at all. This young man was reaching down and picking up small objects and throwing them into the ocean. He came closer still and called out Good morning, may i ask what it is that you are doing? The young man paused, looked up, and replied "Throwing starfish into the ocean" I must ask, then, why are you throwing starfish into the ocean?, asked the somewhat confused wise man. To this, the young man replied, "The sun is up and the tide is going out. If I don't throw them in, they'll die." Upon hearing this, the wise man said, "But, young man, do you not realise that there are miles and miles of beach and there are starfish along every mile? You can't possibly make a difference!" At this, the young man bent down , picked up yet another starfish, and threw it into the ocean. As it landed safely in the water, he said, "It made a difference to that one." 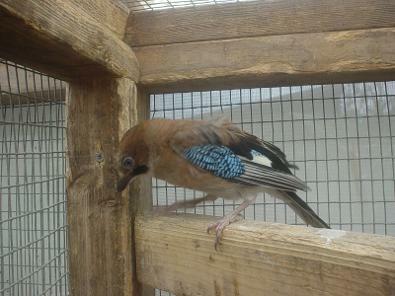 Jessie the Jay came to us as a baby. Jay's are often found on the ground when fledging and normally should be left if found, as parents would be looking after them. Unfortunately this bird was bought to us without the normal phone call and had been in their care for over a day so may have been risky to return where this Jay to where found. 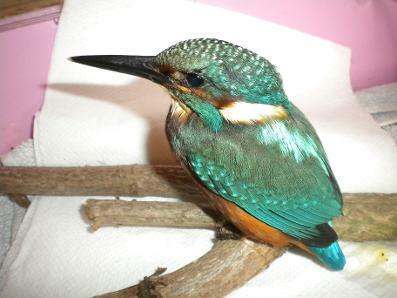 This young adult Kingfisher flew into a window and was concussed for several hours. After just 2 days with us she was released back to where she came from, and flew away fit and healthy and full of whitebait fish. Betty the bald hedgehog. Came in weighing 124 grams at 6 weeks old because she was found walking around in a garden during the day and had just a few spikes. Now weighs a healthy 700 grams at 11 months old. Lots of news coverage can be found if you google "Betty the bald hedgehog" We believe that her condition is due to a genetic disorder because 12 months before Betty came in we had a male bald hedgehog come in from exactly the same area of gorleston, we named him Baldrick but sadly he died at 14 months old. As Betty does not have any problems other than the obvious lack of spikes her treatment consists of an occasional light oiling of the skin using Sweet Almond oil. 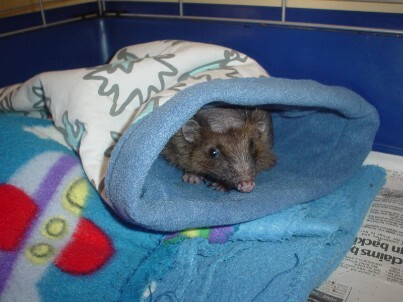 The snuggle sack and 10 others were made by Annie Obrien all the way from the USA. Thank you Annie. 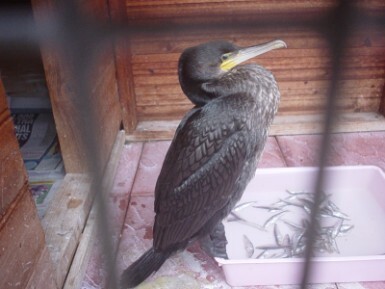 This is an adult Cormorant which was found on Acle playing field, he was weak and starving on arrival. 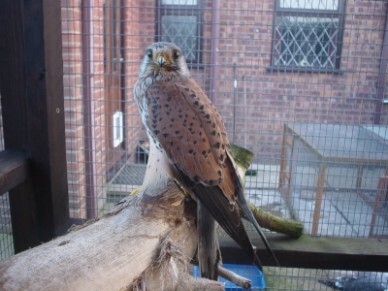 It took us 4 weeks to get him fully fit for returning to the wild at Breydon water. This bird ate vast amounts of fish during his stay with us. Adult male Kestral clipped by a car. His left leg was injured and he was concussed, but he is making very good progress and hopefully will be released back to where he was found during the following few weeks when he is fully recovered. Released march 2011. 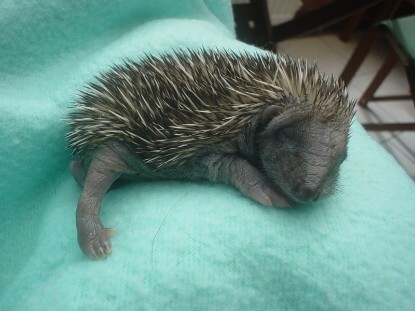 We take in 160 - 180 hedgehogs every year and lots are just tiny babies like this one who is 9 days old (there eyes open at 13 - 14 days old) bottle fed with Esbilac and gradually weened onto mashed tinned cat food from around 80 grams. This little chap is just 55 gms. 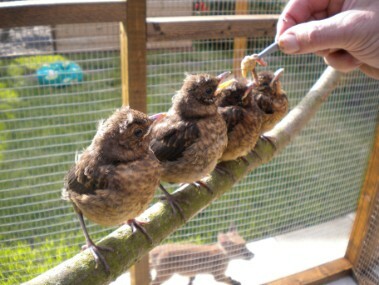 These are just 4 of the many baby blackbirds we rear each year. Note the Fox cub in the background. This is Baxter a 3 day old Roe deer who was found trying to cross a busy main road. 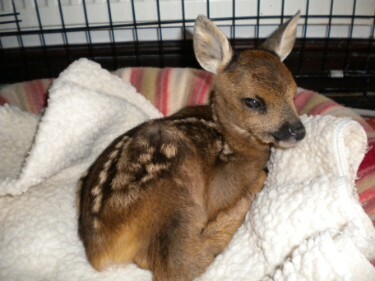 Most baby deer do not need rescuing but Baxter did as his circumstances meant he would have been killed on the road. OK so he isnt the prettiest baby ever, but we rear several of these each year. 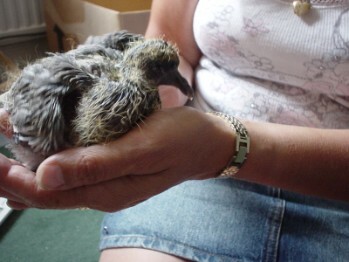 This ones name is Zug and is a wood pigeon. Pigeons are amongst the easiest birds to hand feed using a feeding syringe and Nutribird A21 baby parrot feeding formula. A herringull chick 1 of around 35 we take in each year and rear till they fly from our garden. As you can see we look after them very well and this little one was only alone for 2 days untill he got a friend in with him. 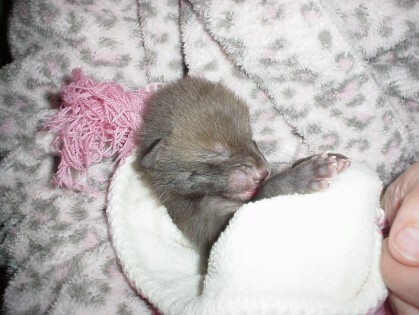 This is Dudley a 7 day old fox cub. He was found in a field in lincolnshire next to the dead body of his mum who had been shot. His brothers and sisters were also dead. How dudley survived is a mystery but a very caring man out walking his dog found him and drove the 180 mile round trip to bring him to foxy lodge. Its people like this that constantly amaze us at how caring some people really are. Released in a secret location at 5 to 6 months old with Demi a female cub of same age and bought up together. Orla a female tawny owl on the left was aprox 8 months old on arrival to us during first week of jan 2010. She was found by side of road having been hit by a car. She was badly concussed with a few cuts and both eyes firmly closed. After 1 week she had both eyes open but her responses were very slow. 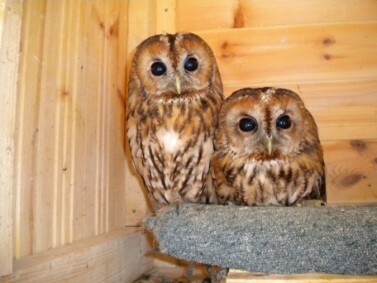 Marlo who came to us 3 months later a male tawny on the right had also been hit by a car and not only badly concussed he also had a badly broken wing and could not even stand. 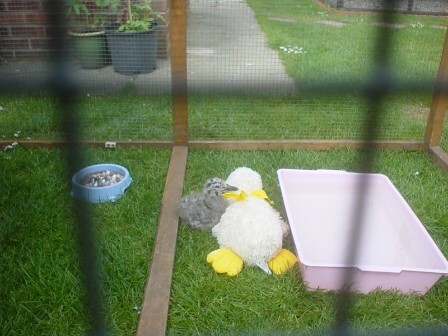 Both are now feeding themselves and we hope to be returning them back into the wild when fully fit. Marlo's wing mended very well and can now fly again. Since being in together they are always side by side so maybe love is in the air! Both owls have now been released fully fit with the second chance they both deserved. 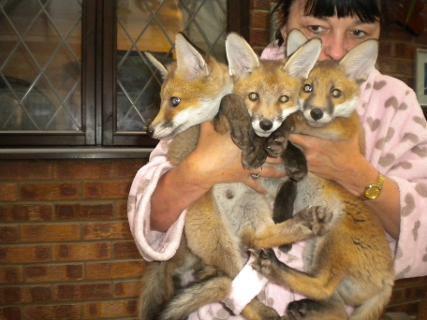 The 3 fox cubs are just 4 days old in the top picture although they were only a few hours old when first found. Their mum had been shot in the chest by a shotgun and escaped just long enough to give premature birth to them on the ground before she died. She didn't even have the time to clean & feed them. Fortunately a man walking his dog found them. They were trying to suckle from their dead mum. The cubs were picked up from Norwich and bought back. They each weighed less than 100 grams. We kept them warm with a heat pad and reared them on Esbilac milk replacement formula. They are 14 weeks old in second picture and each weigh nearly 3 kilo's. There is a lot we could say about this story esp about the person who shot their mum, but all we will say is that all 3 were successfully soft released and even after 6 months of freedom are still being supported with food and water. 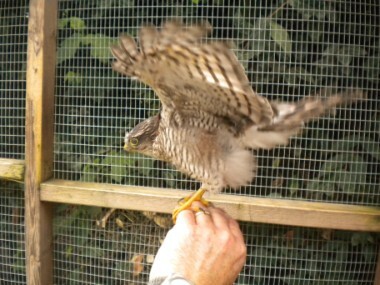 This young sparrowhawk flew into a window and was badly concussed and also had a damaged wing. He had to be hand fed for several days until he started feeding himself. After 5 weeks he was fit and strong and released back where he came from to take up his old teritory. The picture was taken while making him excercise his wings a couple times each day. 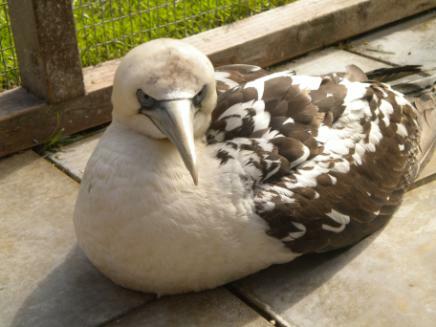 This adult Gannet was bought in very weak but after 4 weeks of fish therapy was fit and feisty enough to be released back to the beach. So when your watching a Gannet diving for fish when walking your dog on the beach you may just be watching this one. 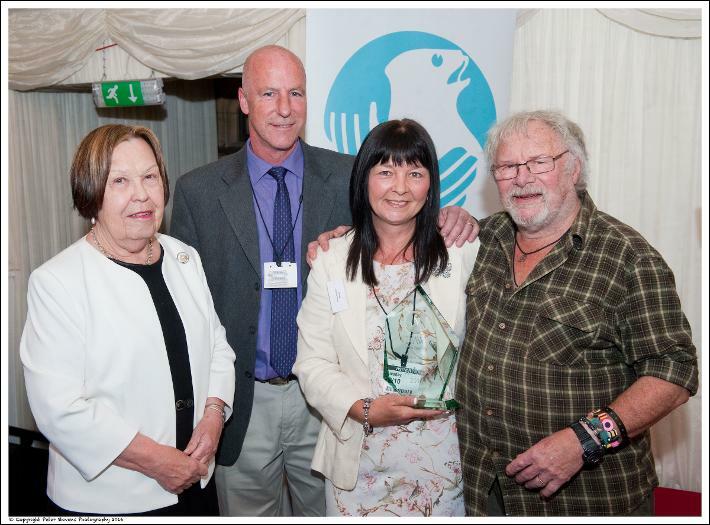 During 2016 we were recognised by the mayor of great yarmouth for the work we do for wildlife and by IFAW the International Fund for Animal Welfare by receiving the wildlife rescue award which was presented by Bill Oddie and hosted by Baroness Gale in the house of lords. We both had a great day and were honoured to receive this award.